I am privileged to announce that I am now part of the Verge Gallery group. I along with 6 other photographers, Jamie Johnson, Rico Mandel, Claire Mallet, Susan Swihart, Sarah Hadley and Tami Bahat. I came to be part of this group through yourdailyphotograph.com. Shana Nys Dambrot (a well known Los Angeles art writer, and friend of mine) was curating a month for the site. When I found that out, I contacted her and asked if I could get in. She said she was all booked up but if there was a cancellation then I was in. A few days later she messaged me and said Henry Rollins (awesome!) cancelled. I gladly took Henry’s place and consequently sold some work! I saw that the Verge Group was looking for a new member, I applied, Daniel accepted me and now here we are. 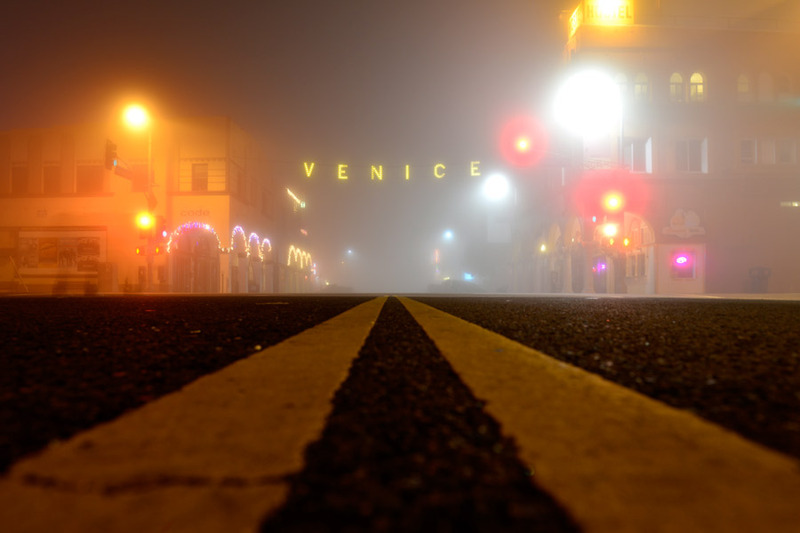 This was an image I shot while I was still living in Venice. Sometimes the fog will roll in very thick, so one late night it did. I went down to Windward, got down on the ground, as I had no tripod, and made the shot you see here. So this Sat. night the 19th of July from 7-9 pm I am having my first official opening at the gallery. I have 5 new works continuing on in the Venice Beach theme as I feel that is what got me started here, so why not pay homage to that? I am looking forward to showing a lot of the work I have shot and it will be a great place to do it. Now I will always have a chance to show something new.